The Moto Q9c Windows Mobile Smartphone has been around for almost a year for Verizon, but today they launched a new version that incorporates TALKS technology. TALKS is a new text-to-speech program that allow visually impaired users to hear what is shown on the screen. 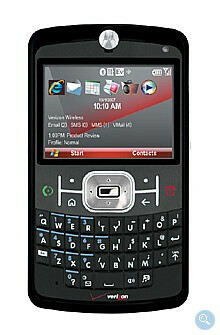 Uses include the reading of Caller ID of an incoming call, dialing a number or add/edit numbers in the Contacts list, reads and writes text messages, e-mail, and documents in Mobile Office, access and compose MMS messages, the use of Mobile Internet Explorer, and allows the user to control the speech volume and rate of speech. The rest of the Q9c's features remain the same: Windows Mobile Standard 6.1 OS, 2.4" 240x320 display, 1.3MP camera, Mobile Office with Word, Excel, PowerPoint, and Adobe PDF reader, Internet Explorer Mobile, Windows Media Player 10, VZ Navigator, and supports microSD cards up to 8GB. Pricing of the Q9c with TALKS is $249.99 after a $70 rebate with a 2-year contract, $319.99 after a $70 rebate with a 1-year contract, or $479 without a contract. So on top of using a Q, *shudders* AND using winmo, *stabs self* the blind user will have to navigate the menus, internet, and email by VOICE?!?? *jumps off cliff followed by several hundred lemmings* Now thats just cruel!